Heather uses her superlative skills as an Magician, Mentalist, Motivational Speaker, and Mindfulness Trainer, to create extraordinary experiences leave audiences delighted and inspired! Heather's show is contemporary, hip and packed with variety. The show has real chemistry with audiences because it gracefully balances between the right amount of edge, inspiration and audience engagement. Not only a Stage Magician, Heather is a Motivational Mentalist who help people maximize their mind and magnify their mojo! Another element that makes the show so unique is Heather's use of classic physical comedy and satire. Her playful physicality is reminiscent of the great ladies of comedy like Lucille Ball, Carol Burnett and Bette Midler. She brings, the perfect mix of delight, whimsy and elegance to corporate events. Less of a 'Grandstanding' Magician and more of stealth miracle-maker and co-host. Heather makes sparks fly at your event, while also meeting guests in a warm unassuming way, putting them at ease and creating the perfect ice-breaker for them to have the time of their lives. Heather weaves stories, humor and remarkable skill into the program, making every magical effect a compositional masterpiece. A highly skilled FEMALE corporate magician is a rare find. This will add an even deeper element of surprise, elegance and sultry charm to your very hip 'happening'. "How to Master your Mind and Maximize your Mojo"
Heather's customized TEAM BUILDING and COMMUNICATION programs remove blocks to innovation and help optimize workflow while while truly surprising you with the latest findings in brain-science. 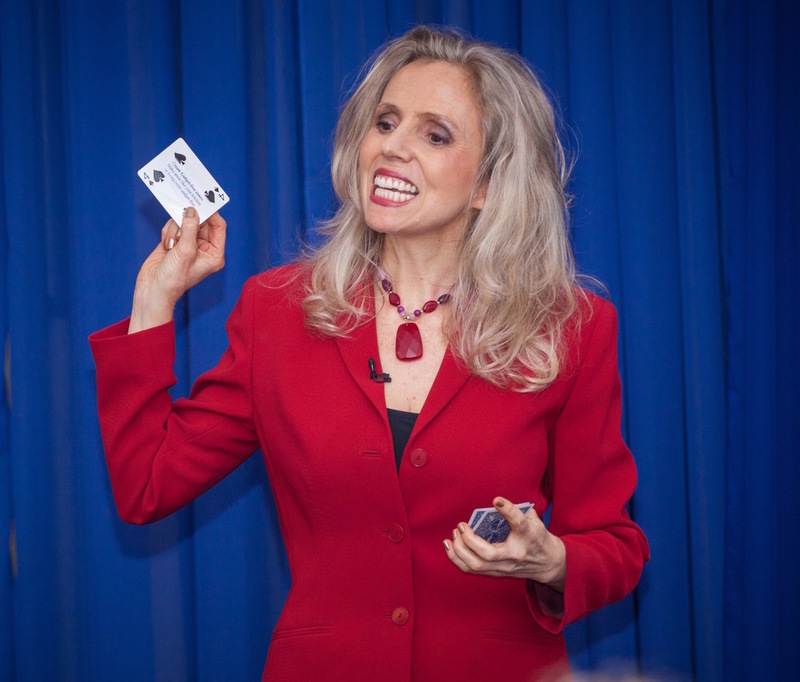 Heather draws from her experience as a Motivational Mentalist to bring high entertainment values and take-home value. Heather's SPEAKER / TRAINER video illustrates how she uses magic to help people Maximize their Mind. This program delivers tools and distinctions that will increase the bottom line by helping in the retention of top talent, increasing productivity and creating a happy cultures. Heather has a secret formula that creates a far deeper level of energized collaboration, and innovation... "The Magical Immersion Experience". Request your complimentary Entertainment Consultation with a live Skype Magic demonstration!